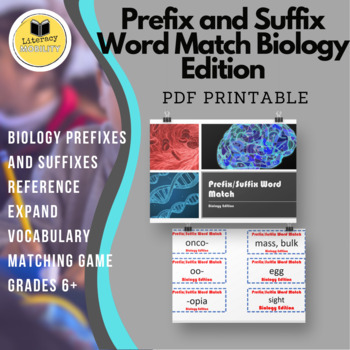 Use the Prefix/Suffix Word Match: Biology Edition game as an center activity or classroom game to teach your middle and high-schoolers the prefixes and suffixes needed to be proficient in biology terms. Simply print each page on card stock or on regular paper and laminate. Cut out each prefix/suffix and its meaning. Use just a few or all. Place cards face down and match the prefix/suffix to the meaning. The person with the most matches wins.